It has been about two years since there has been snow in Snellville, Georgia. I, for one, have missed it! It was a pleasure to awaken this morning to a slight covering of snow on the ground. I took some photos around my yard this morning at 11:00 AM, reflecting some of the snow. By 1:00 PM, it had all melted away! With the blizzard conditions being experienced to the north of us, I was hoping that we would get more snow here today. It’s always fun to make a snow man with my son or pull him around in the sled through the yard. This weekend, we were planning to take a ski trip to North Carolina with my son’s scout troop. What a disappointment it was not to go as a result of the weather conditions! When one grows up in ski country, one must take advantage of all the fun that the snowy winter conditions have to offer. For all of those folks who have a distaste for snow and winter weather, I dislike the cold, but I love the snow. 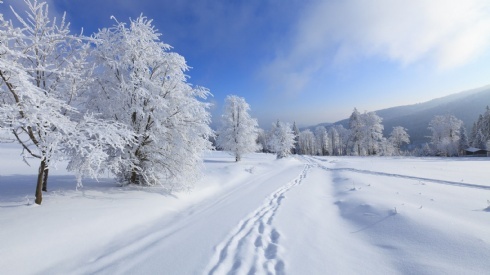 In order to avoid cabin fever, it is important in areas that experience snow to have outdoor activities that one enjoys. What I really miss about not living in a snowy winter region is the skiing, as well as snowmobiling. Making snow people and snow angels, having snowball fights, munching on icicles – or just walking in the snow and enjoying its beauty – are activities that I miss. Of course, I do not miss the high heating bills in winter, nor driving in treacherous conditions involving snow, ice, and slush. I do not miss the road salt that eats up my vehicle, and requires me to wash it, frequently, at the car wash. I do not miss water dripping through the ceiling due to all of the snow on the roof of the house. And, I do not miss frostbite (which I have experienced once in the past) due to the polar conditions. I can further leave behind the extreme wind chills that make the outdoor temperatures so much colder than they really are. There are definitely positive and negative things that one can experience as a result of snowy, winter weather. I’m glad to have had these experiences, particularly so that I can know how to best care for myself and my family in conditions such as these. Be prepared, think carefully, and be safe out there!